Improvements to 28th Street Park on Avenue F are greatly needed. Two parks in Bayonne are in line for $1.5 million worth of improvements, courtesy of two Green Acres grants, administered by the NJ Department of Environmental Protection, and Bayonne officials who applied for the grants. The city is receiving $886,000 for improvements to the 17,500-square-foot Cottage Street Park, on the corner of Cottage and Hobart streets, and $627,000 for the 13,360-square-foot 28th Street Park, on Avenue F between 28th and 29th streets. 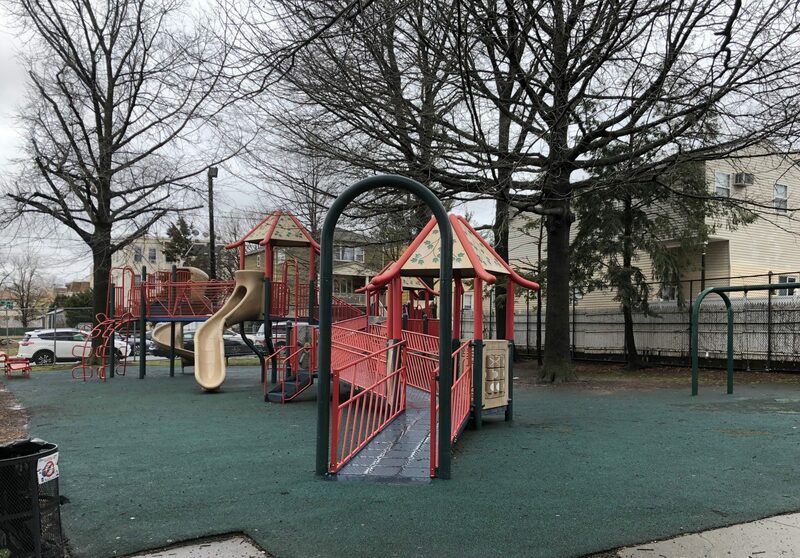 Both parks are in a state of disrepair; this grant aims to turn the parks into a “new standard for future park construction in Hudson County,” according to the grant application. All existing physical features in the park will be removed, except for trees. New playground equipment and water fountains will be ADA (Americans with Disabilities Act) accessible with new bonded rubber surfacing. Both parks will receive new full-court basketball courts, concrete sidewalks, and fencing. The Cottage Street Park proposal includes plans for a synthetic turf dog park. The Bayonne City Council expects to issue a request for proposals for a contractor to implement the improvements this spring with an expected completion date sometime in the fall. The primary concern of residents who spoke at the public hearing at the Bayonne City Council meeting on March 20 was the extent to which green infrastructure would be included in the plans. Green infrastructure is planned only for the dog park at Cottage Street Park, which will have an irrigation system. “We should mention it again that [green infrastructure] should be a part of any construction,” said Mike Rusigno, who co-founded the Bayonne Nature Club with his wife, Patricia Hiliard. He mentioned the recently enacted Flood Defense Act, which empowers local governments to impose fees on parking lots and other impervious surfaces to fund improvements to failing stormwater management systems. Bayonne Urban Planner, Suzanne Mack, said she would put Pestorino in touch with officials in charge of communicating green infrastructure needs to the New Jersey Department of Environmental Protection, as well as relay those concerns to those officials.